It’s inconceivable that in any other western democracy, a national leader would tolerate a cabinet minister behaving as a parallel figure on the world stage and actively undermining the whole edifice of government at home. Yet that’s precisely what Australia’s Julia Gillard is doing through her failure to crush the audacious come-back campaign being mounted by Kevin Rudd, the man she dislodged as prime minister in a palace coup last year. The current Gillard-Rudd impasse is an abject lesson for politicians everywhere on the absolute necessity to not just marginalise their predecessors when they take office but to drive a stake through their hearts. Gillard was warned that having knifed Rudd for the Labor Party leadership last June, it simply wasn’t in his nature to meekly accept his fate and that she would need to watch her back. Barely scraping over the line at the subsequent election in August, Gillard gave Rudd the job of foreign minister. She had no choice. Her government is on a knife edge in the current parliament and one vote is all that separates her from electoral oblivion. Rudd made it clear that it was either the foreign gig or he would leave politics and precipitate a bye-election in his Queensland seat that Labor would surely lose. Thus it is that Australia’s relations with the rest of the world are in the hands of a man also holding a gun to his leader’s head. Anyone else might be content to strut the international stage as Rudd does, posing as one of the big players and studiously trying to paper over Australia’s status as a middle ranking power at best. Only someone with a world class ego would claim credit – as Rudd does – for being a prime instigator of the no-fly zone over Libya. That’s right. Not Barak Obama, not Nicolas Sarkozy but Kevin – the Tintin lookalike Wonder Boy from Down Under. This pompous self-aggrandisement might be excusable at a time when the opinion polls show that most Australians can’t help liking a foreign minister who’s too big for his boots. The problem is that like Dracula, the part of Kevin Rudd that wants to run the whole shebang refuses to die. He’s actively positioning himself for another tilt at the leadership and in doing so, is slowly leeching the life out of the Gillard government with a display of disunity that – if it continues – spells certain death at the next election. As Gillard herself staggers under the weight of a host of issues like the carbon tax and border protection, each of which could bring her down, she’s got the extra burden of the grinning Queensland monkey on her back. Kevin Rudd has taken to making unscheduled visits to shopping centres outside his home state, where he’s mobbed by old ladies and other people with nothing better to do than pat him on the back and encourage him to move against his increasingly unpopular leader. Last week, he uttered a loaded “we’ll see” when one of these mall creepers suggested that he make a comeback. He told journalists later that he was merely “being polite” in not throttling the suggestion at birth. Hello? Who does this guy think he’s fooling? The fact is that Rudd is only popular with people who don’t know him. A Queensland QC who does recently reminded Grubsheet that Rudd “mainly inspired loathing” when he was cabinet secretary in the state government headed by Wayne Goss in the early 1990s. When he went to Canberra, Rudd’s narcissism and sense of entitlement is said to have grown in direct proportion to his political advancement. As prime minister, flight attendants were reduced to tears if they brought him the wrong meal. And his fellow MPs soon discovered that for Kevin, loyalty is a one way street. It explains the almost total absence of conscience, let alone grief, when Labor decided it could stomach his hubris no longer and threw its weight behind Julia Gillard. The only tears shed were Kevin’s in an astonishing display of self indulgence that will seem even more bizarre through the prism of history. With public sentiment now turning against Gillard, Kevin Rudd clings to the fantasy that he can ride the opinion polls to a second coming. Yet his chances of regaining the leadership are zero given the hatred for him in his own ranks. Labor is a tribe with a fierce sense of collectivism. Rudd is a loner and friendless, apart for a gaggle of desperate MPs in marginal seats who think they might be able to stave off impending defeat by enticing him to their own shopping centres and trying to bathe in the same limelight. They ought to know better. To paraphrase the Iron Lady, this bloke’s not for sharing. No one seems to be asking the obvious question. What on earth is the foreign minister of Australia doing at a retail complex in western Sydney? On Australia’s relations in its immediate backyard, Downer is equally damning – backing his Liberal successor, Julie Bishop, in busting wide open the hitherto uncompromising bipartisan stance on Frank Bainimarama’s regime in Fiji. However much Labor may be inclined to use the Mandy Rice-Davies line, “well he would say that, wouldn’t he?”, Downer is making a telling point. Kevin Rudd is not doing the job he should for Australia. Worse, he’s embarked on a personal crusade that can only destabilise an already shaky government. How can that be in anyone’s interest but his own and that of Labor’s enemies? In a memorable encounter Grubsheet once had with Jimmy Breslin – the celebrated New York columnist – Breslin spoke of the curse to humanity of “half people with full blown egos”. It’s a phrase that might have been coined for Kevin Rudd. To say that this is uncharitable is an understatement. Like all of us, Kevin Rudd has his faults. But the Australian people elected him prime minister and were deprived of any say in his removal by the thugs of the ALP machine. I think he’s got every right to be unhappy and exploit whatever chance he has to make a comeback. 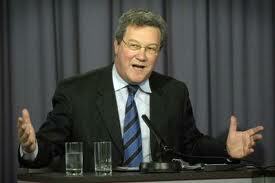 Fancy using Alexander Downer as a Rudd critic. Downer can be blamed for a lot of the mistakes in foreign affairs, such as the policy on Fiji. Rudd was only continuing what had been decided long before Labor came to power. Lay off the bloke. People are greeting him in shopping centres not just out of sympathy but because they like him and feel cheated. They voted for Kevin Rudd and have turned their backs on the dreadful woman who replaced him. Thepeople of Australia did not elect Rudd to the Prime Ministership, the Labor members of the Parliament did and Rudd was elected to parliament in the same way as all others, through the voters in his electorate. The sooner Australians grasp this basic fact, the soner they will start to understand how their governments work.